Pelmeni is considered to be the national dish. 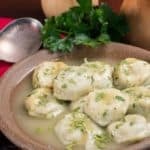 This Russian mushroom pelmeni is a vegetarian version, you will love it. 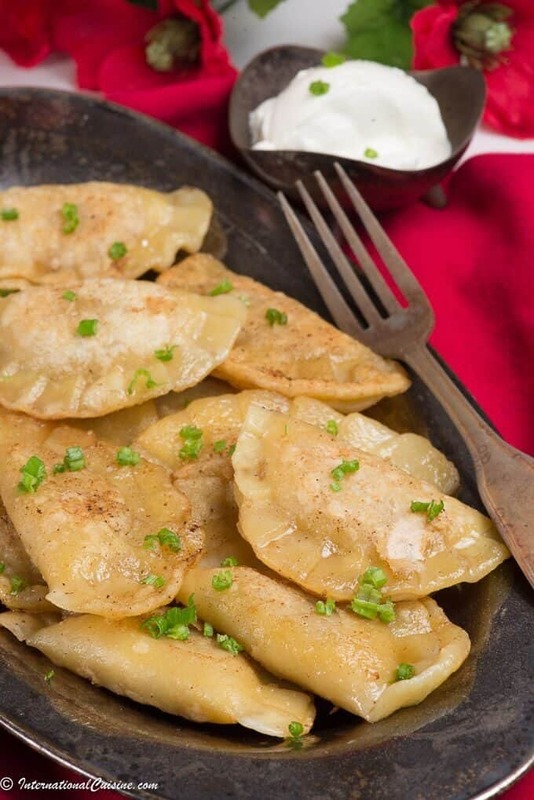 Pelmeni are basically little boiled dumplings stuffed with a delicious filling. 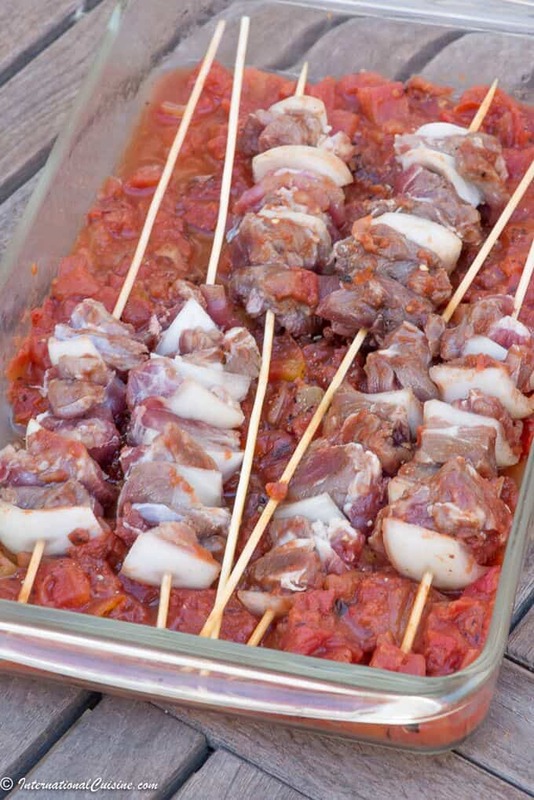 Traditionally this is made with a combination of meats and onion but many varieties exist. I bought a pelmeni maker which made the process super quick and easy. It is not totally necessary but I highly recommend it. Pelmeni originated in either the frigid region of Siberia, or Ural, both making strong claims. 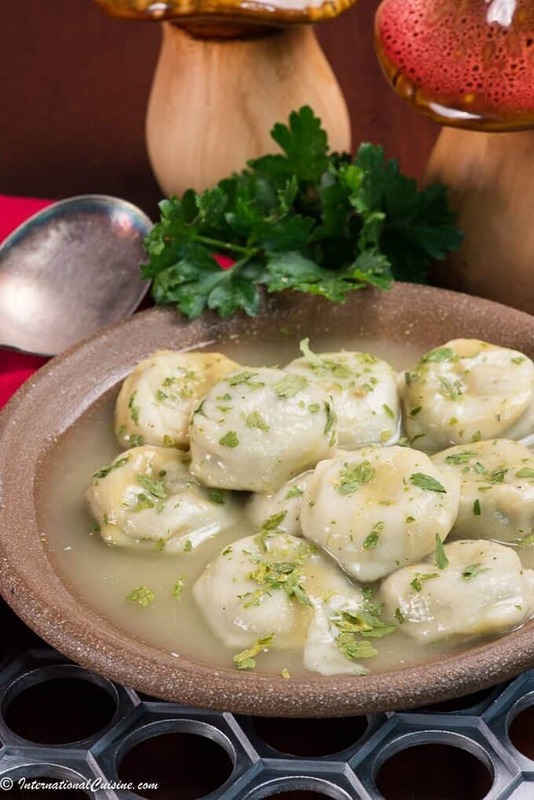 Russian mushroom pelmeni are popular all throughout the country. They are typically served in butter, oil, sour cream or in a simple broth which was how I served them. They are wonderful little puffs of goodness that would be perfect served with any one of those toppings. I loved the mushroom version but I can see how a meat version would be awesome too. Often the meat version is made with three types of meat, beef, pork and veal. Other versions of pelmeni are filled with sauerkraut and other vegetables, even fish. The possibilities are endless. 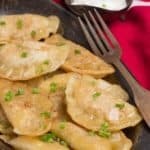 These are made with a thin dough and then the stuffing is placed in each hole of the pelmeni maker, then another layer of dough is placed over the top. As you roll the dough the little puffs of stuffed pelmeni fall out of the bottom of the pelmeni maker. Alternatively, you can cut out small rounds using a small glass and add a spoonful of the filling and then seal the edges. These are somewhat time-consuming to make so make a bunch, they freeze beautifully no matter what filling you use. Once the Russian mushroom pelmeni are done they are simply boiled. If you are going to freeze them, do so before you boil them. Did you know that Russia is the largest country in the world in size and covers 9 time zones? 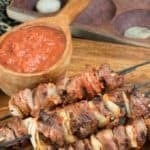 If you would like to learn more about this massive country be sure to check out “Our Journey to Russia” plus get some more delicious authentic recipes. You will love this vegetarian version of Russia's national dish Pelmeni. Butter olive oil, sour cream or vegetable broth. Peel the onion, mince it. Heat a skillet over high heat and add the mushrooms, cover with a lid. Once the mushrooms release their moisture, take off the lid and cook until the water evaporates. Add in 1 tablespoon of oil, reduce heat to low. Add in the minced onion and saute for about 10 minutes. In a bowl mix together the flour, 1 teaspoon of salt, 3/4 cup of boiling water, and 4 Tablespoons of oil. Knead this together until you get a dough that is elastic and smooth. Roll out the dough to be thin but not too thin to cover the pelmeni maker, it will hold the filling in the pelmeni maker. Add a teaspoon or so of the filling in each hole. Roll out another piece of dough and place over the top of the stuffed pelmeni and using a rolling pin roll the top so that they fall through the bottom. If you do not have a pelmeni maker just roll out the dough and cut out 2 1/2" circles using the rim of a small glass. Scoop a bit of the mushroom mixture into the circle and fold in half, be sure to press the edges together tightly and make them in the shape of a half moon. Put a large pot of water on the stove to boil with 1 teaspoon salt and the bay leaves. When the water is boiling add the pelmeni gently into the water and stir lightly until they pop up to the top. Cook for about 5 more minutes and remove with a slotted spoon. Serve hot with your choice of topping olive oil, or butter, or sour cream. Alternatively you can serve them in a hot vegetable broth and garnish with parsley. Romanian meatball soup called Ciorbă de Perişoare will quickly become a family favorite, I mean really who doesn’t love a meatball right? This recipe calls for a herb you have probably never heard of called lovage. I have no idea how this herb is not really popular here in the states. I would describe it as bitter, like a celery leaf, but when it is cooked in the broth, something magical happens. It truly adds a unique flavor that I have simply fallen in love with. It is really not like something else, so I highly recommend you get some here and try it. I fell so much in love with the flavor of lovage that we now grow it in our garden. If you would like to try fresh lovage you can buy seeds here. I have never seen it sold fresh in a market here in the USA. If you have, please let me know where, in the comments below. 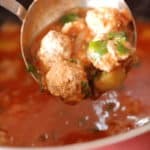 This Romanian meatball soup has a sourness to it from vinegar and the meatballs are made with a combination of pork and beef. It is a hearty soup with many root vegetables like parsnips, carrots, and celery that your family will love, especially in the cooler months. It can get quite cold in Romania and soups and stews are staples there. Be sure to also make the baked Mămăliga with it. It is made from cornmeal and makes a lovely accompaniment to the Romanian meatball soup. Also it would be appropriate to serve this soup with a side of sour cream and a hot chili. That would be customary there and is a great addition! Did you know that Romania is home to the most beautiful waterfall in the world. It is called Bigar Cascade Falls in Caras-Severin. It was voted number one in the world by World Geography. It is unique because of its stunning beauty and the way the water falls. If you would like to learn more about this most interesting country of Romania, be sure to check out “Our Journey to Romania” to learn more. You will also find more delicious and authentic Romanian recipes you are sure to love. Have you ever tried lovage? If you have I would love to hear your description of it in the comments below. Also if you choose to make this delicious Romanian meatball soup send me a picture of it and let me know how you liked it. A super satisfying hearty soup made with a unique herb called lovage. You should try it! This soup is typically served with a hot chili on the side as well as some sour cream, I recommend both. Add the diced onion, parsley root or celery, parsnip and carrots along with the soup bones into the boiling pot of water. Soak the bread in a bowl of water and then squeeze out the excess water and mash the bread with a fork. Mix the ground beef and pork with the minced onion, the mashed bread, rice and season with salt and pepper. Mix together thoroughly and make small meat balls with wet hands. 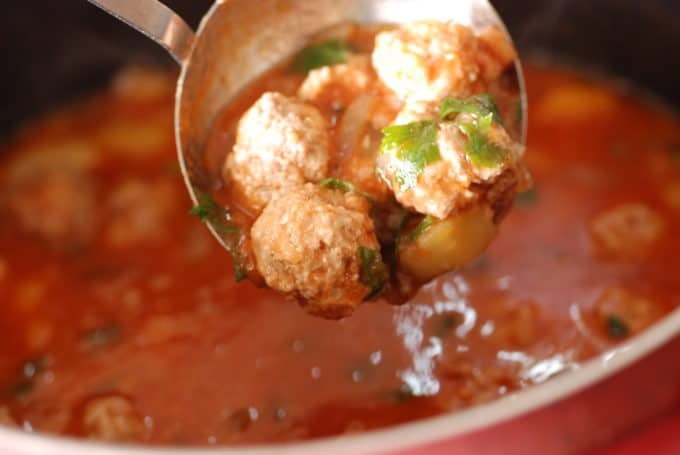 When the vegetables become fork tender, skim off any fat from the soup bones and add in the meat balls to the boiling water. Reduce heat to simmer, cover and cook for 30-40 minutes. When the soup is almost done and the meat balls have risen to the top, add in the tomato paste and stir. Finely chop the lovage or parsley and celery leaf and add it to the soup. Add in the vinegar and stir. Remove the soup bones before serving. This soup would traditionally be served with sour cream and a hot pepper on the side which I would highly recommend. In Cuba, lechon asado is made for a celebration. Many times a whole pig is cooked in the ground and covered with banana leaves. It is a tradition and a feast. They also often roast the pork in a specially made box called a Caja china. 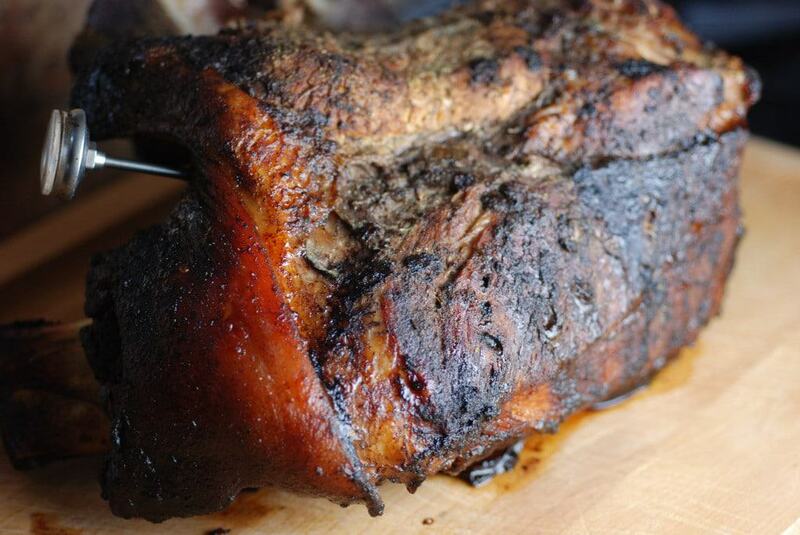 This roast pork recipe is one of the best I have had and I attribute it to the Mojo sauce that it marinates in. Please note that this recipe calls for marinating overnight so plan accordingly. The aroma is outstanding while cooking. 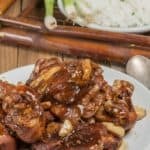 I was able to find a nice pork shoulder with the skin on, and the results, awesome and oh yes, those caramelized onions, to die for! 2 Tbsp salt and 1 teaspoon salt. Buy a nice large pork shoulder or fresh ham try to buy one with the skin on the fresh ham. THE NIGHT BEFORE: Take your pork shoulder or fresh ham and stab it all over making deep stabbings in the meat all over the roast. Next take your salt pour about two tablespoons full in your hands and rub deep all over the pork roast or fresh ham sticking your fingers in the deep stabbed holes to penetrate the salt well into the meat. Do this all around the meat. You will need about 2 tablespoons of salt all together. Rubbing deep into the meat all over and into the holes made with a sharp knife. Obviously use care when stabbing the meat with a sharp knife to not cut yourself. After salting put the pork to a side. In a blender add the lime/lemon or sour oange juice, garlic cloves, and the seasonings bay leaf, cumin powder, oregano, pepper, 1 teaspoon salt. Blend on high until all is liquified. This is your Cuban Mojo, pour one cup of the mojo in a jar cover and reserve for later. Now take your pork roast and pour the rest of the sauce all over the pork roast rubbing the mojo sauce deep into the pork meat in the slits or holes. 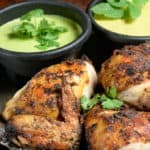 The secret is to make sure you rub your pork meat or fresh ham with all this lime/garlic sauce making sure it is well introduced into the meat. When done sprinkle a little more oregano, cumin, black pepper over the entire roast again just a little sprinkle. Cover with aluminum foil; and refrigerate until the next day for roasting. Next day remove pork from the refrigerator let stand on the counter for at least an hour then put into a preheated 325 degree oven. Depending on how large a roast you have roast about 3 to 4 hours or a little more. Pour a half cup of the reserved mojo and baste your roast every hour with some of the mojo. Roast is done when the juices run clear and the meat is tender. Do not cover with aluminum foil to roast. You can tent the roast with aluminum foil but do not crimp the edges all around. You want to roast your pork meat not steam it. If the roast starts to get to brown on top tent it with the foil. take a large piece of foil and fold in half then put over the roast leaving the sides open, no crimping. A five pound roast can take as long as five or six hours slow roasting. When done remove roast from the oven take out of the pan put into another pan. Let roast rest for a bit. In your pan there should be lots of pan drippings pour them into a frying pan over medium heat and add the onions and fry them in the drippings. Next take half cup of the reserved mojo from the refrigerator and pour into the onions sauteing everything for about five minutes. After about 10 minutes slice all of your roast and pour the mojo with onions all over the meat mixing it well into all of the pork meat. Serve your pork with Moros and Christianos (Cuban rice and beans) for a real treat, and make a Cuban sandwich with the left overs! 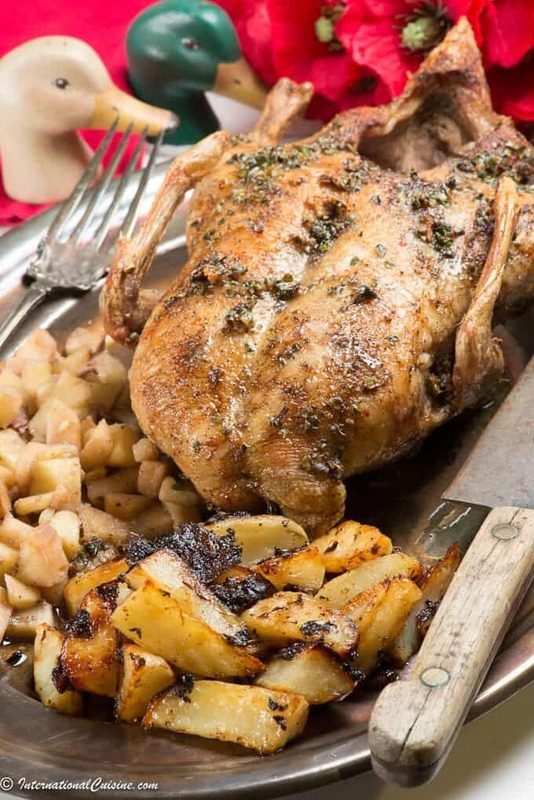 Qatari Harees is a delectable main dish made with beaten wheat and chicken. There are similar dishes all over the region that go by similar or different names. I made one very similar for Oman but it was made with beaten rice instead of wheat. 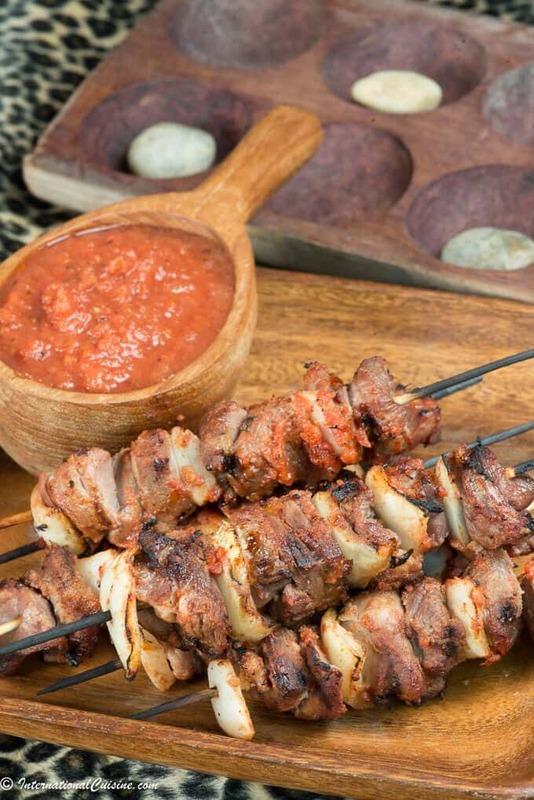 It is a true comfort food and you should also make the Qatari khubz arabi for an authentic experience. You will use the bread to scoop up the Qatari harees with your hand. 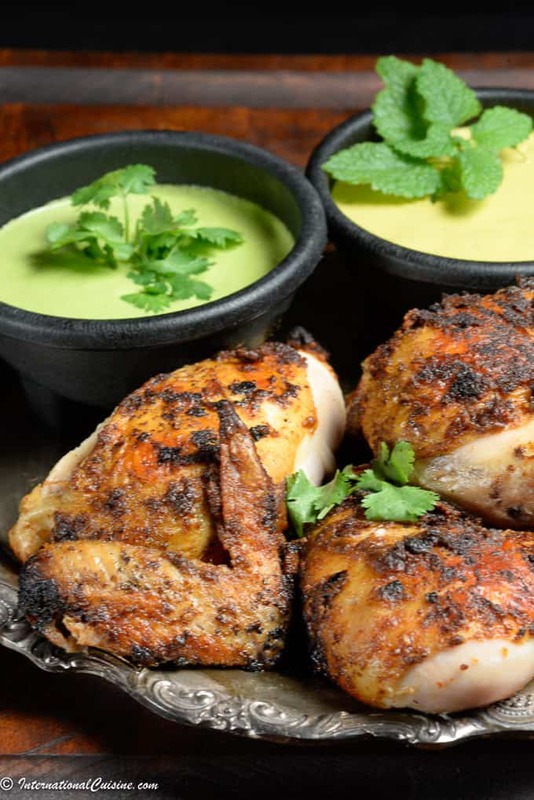 As Qatar is one of the wealthiest nations on earth, you can truly get just about any cuisine in the world when visiting the capital city of Doha. However when I travel, I like to immerse myself in the culture and traditions of the nation. This Qatari harees is an authentic dish that is beloved and you can get a taste of Qatar without even leaving home. It is often eaten during the holy month of Ramadan. If you are visiting Qatar the best place to try it is in a souq which is like a mall with all sorts of different stalls of goods and food, unless of course you get invited into a local’s home for a meal. Did you know that only 12 percent of the population are Qatari? The rest are foreigners brought in for work mainly in the oil and gas sectors as well as hospitality. If you would like to learn more about the tiny nation, be sure to check out “Our Journey to Qatar” . 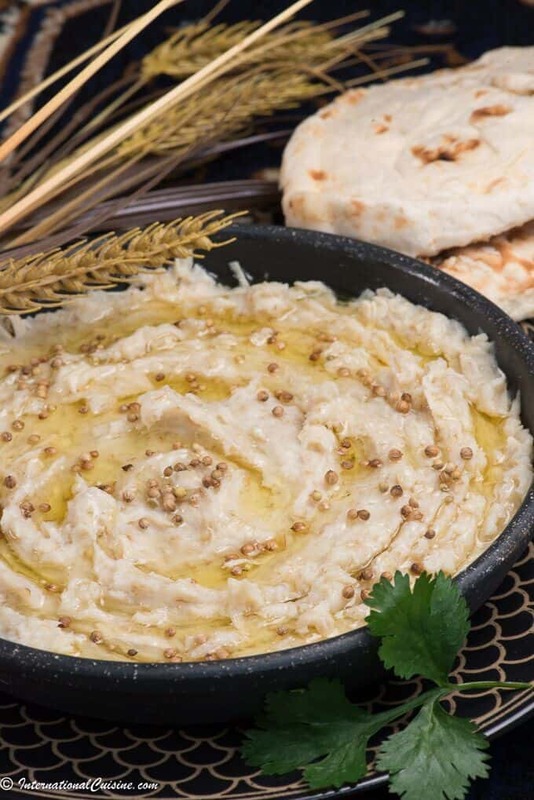 You will be able to also get more delicious recipes including the khubz arabi (Arabian Bread). Actually the national dish for Qatar is Machboos ( a spiced rice dish with meat) which I made for Bahrain which would also be a wonderful choice if making a Qatari meal. 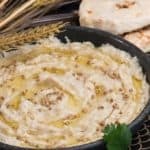 This recipe calls for harees which is a whole wheat, you can find this at your Middle Eastern store or here on Amazon. Also you need to soak the wheat overnight so be sure to plan ahead when you want to make your Qatari harees. 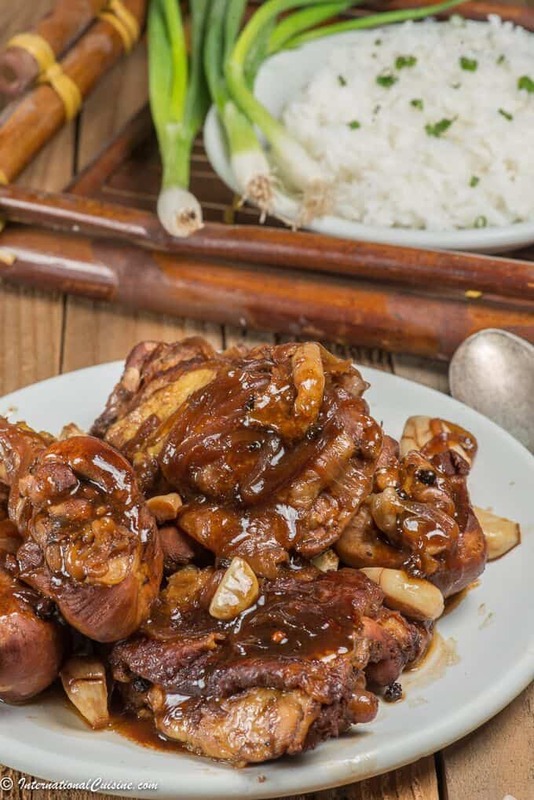 Qatari Harees is a lovely dish that is a true comfort food. It is often served during Ramadan in Qatar but is perfect anytime. Be sure to make some Qatari Khubz Arabi (Arabian Bread) to scoop it up with. Place the chicken, harees and water in a pan and cook on a low fire for about 2 hours, stirring occasionally. Skim the froth. Blend the mixture by hand or using a food processor until a smooth paste results, then transfer to a serving bowl. Melt the ghee and add the cinnamon, cumin and salt and pepper to taste. Pour the mixture on top of the beaten porridge in the bowl. Please note that this recipe can also be made using lamb and would be totally authentic as well. 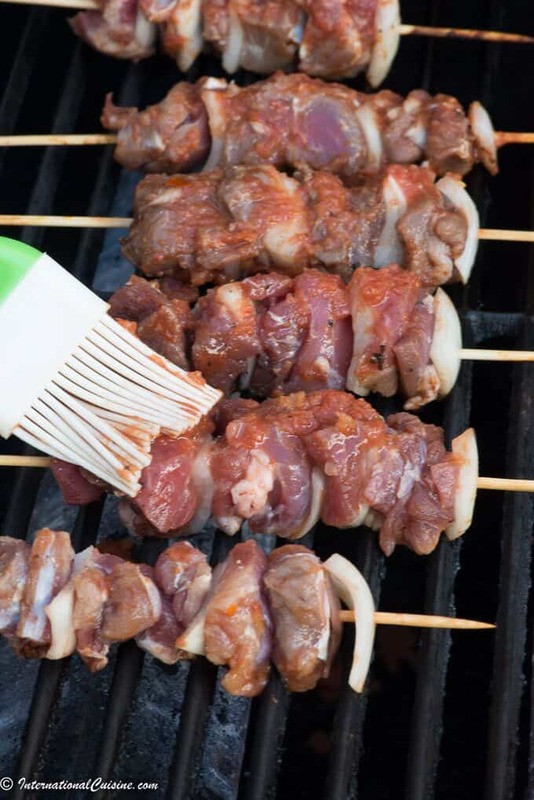 Just use 1 lb of boneless lamb chunks and cook until completely tender. Also be sure to plan ahead as the wheat needs to soak overnight before you cook it. Salted cod with eggs or bacalhau a bras in Portuguese is a beloved dish. Honestly, it is said there are over 1000 recipes for salted cod in Portugal. This particular recipe of salted cod with eggs was mentioned to me on numerous occasions while I visited there as the most loved dish. I got this recipe from our guide Lidia, in Sintra. We had such a great time together, I highly recommend her to anyone visiting Sintra and wants a great guide with an immense knowledge about the history of the area. You can find the company she works for here. Be sure to ask for Lidia! Salted cod or sometimes called just salt cod has been a staple in Portuguese cuisine for centuries, some 500 years. It was a means of preservation prior to refrigeration. The cod is first salted and then dried. The process of this ancient technique, makes the cod tastier. To cook it you must first soak the cod in water and rinse out the salt. Bacalhau was a cheap source of protein and therefore used often in the cuisine. Over time this has changed and although it is still beloved, it is no longer cheap. Bacalhau was nicknamed fiel amigo meaning loyal friend due to its high consumption. It also gained popularity not only in Portugal but other Roman Catholic countries as well because the church forbade eating meat on many days so bacalhau was the chosen fish to consume on the non-meat days. I found my salted cod on Amazon and here is a link if you would like to buy some. They come in cute little wooden boxes. Make sure to get it deboned. 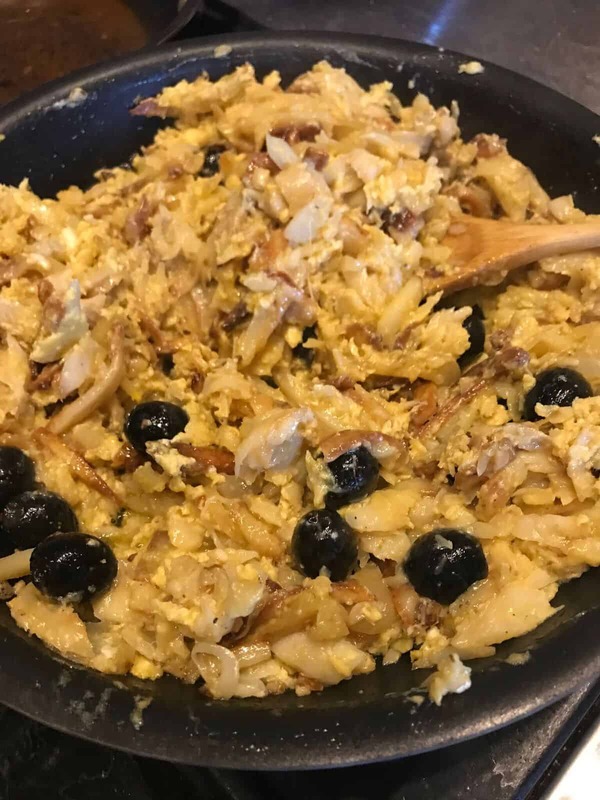 This recipe was an absolute delight, it has of course the bacalhau but also eggs, onion, olives and my favorite part was the addition of fried potatoes. This salted cod with eggs recipe is truly a comfort food and once you try it, you will totally understand why this dish is one of the salted cod favorites in all of Portugal. If you love this salted cod with eggs recipe be sure to check the other authentic recipes we enjoyed as part of our International Cuisine meal. You can get the recipes plus learn more about this fascinating country by checking out “Our Journey to Portugal”. 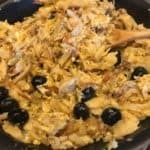 It is said that there are more than 1000 recipes for bacalhau. This one Salted cod with eggs is clearly one of the most popular. 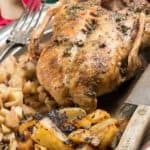 Make it and see why, a true comfort food! You will need to plan for the cod to soak overnight for the recipe. Add about 1 cup of oil into a deep pot or fryer and warm it over medium-high to high heat. Fry the potatoes in the hot oil until golden and crispy, about 7 to 10 minutes. Once the potatoes are fried, remove from the oil with a slotted spoon and place them on a paper towel to drain the excess oil. Add 1/4 cup oil to a skillet. Add the thinly sliced onion, chopped garlic and bay leaf and sauté together until golden, about 7 minutes. Add the shredded cod in with the onions and garlic and cook for several minutes until the fish absorbs the oil. Add the cooked potatoes and mix together. Next, lightly whisk the eggs, salt, and pepper together in a bowl. Add the eggs to the fish and potatoes and cook on very low heat until the eggs are soft, about 3 minutes. It’s important to remove the skillet from the heat before the eggs actually solidify you do not want scrambled eggs. Serve hot and garnish with olives and parsley.